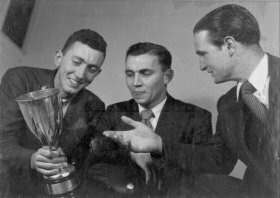 Ralph Francis Joseph Cormack, Allan Iain Forbes Mackillop and George Nash of the UQ Inter-varsity Debating Team. 1929. From the UQ Fryer Library Photograph Collection http://espace.library.uq.edu.au/view/UQ:179606. 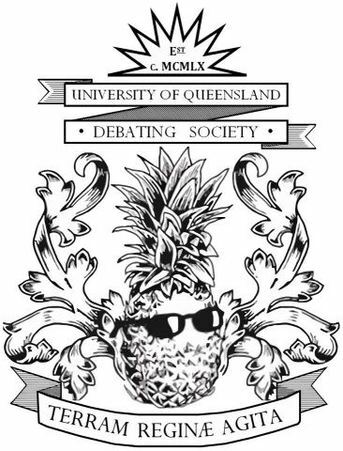 The University of Queensland Debating Society as it stands now was officially established in 1960; however debating has been present at the University of Queensland since its formation in 1909 and has been formally known as the Intervarsity Debating Team. 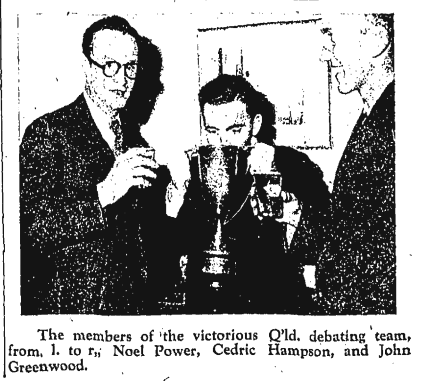 ​As was described in the UQ student publication, Semper Floreat, in 1937, "the Society offers a unique opportunity to undergraduates to express themselves on all sorts of heterogeneous topics, to deliver their pet heresies and to slander their friends in a comparatively sheltered academic atmosphere... So don't forget to roll along to the first debate with all your pet theories and subjects. If you have never spoken before you are like most of us—but don't leave it too late to begin. The sooner you start the sooner you reach perfection.'" (06/03/1937: Volume 6, Issue 1, Page 2). 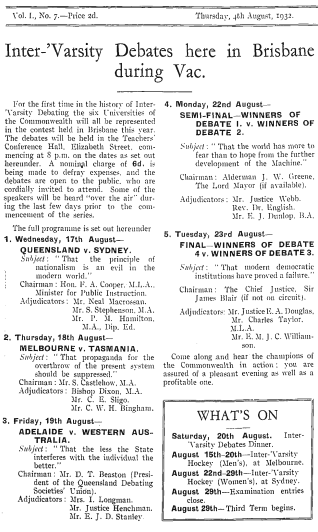 Indeed, in 1932, the University of Queensland Intervarsity Debating Society organised in Brisbane the first ever national intervarsity debating tournament with all six Australian universities at the time (Melbourne, Tasmania, Sydney, Adelaide, Western Australia, and Queensland). At the civic reception in the Brisbane City Hall for the first ever Australian Intervarsity Debating Championship, the Vice-Chancellor of the University of Queensland (Dr. W. N Robertson) stated that "there was a great deal of loose thought spoken and written, but there was no power in the world which was so great as the spoken word when it was delivered with conviction." Those present at the reception included Mr. B. J. Kenna (Director of the Queensland Department of Education), Professor T. Parnell, Mr. J. F. Cafrey (Registrar of the University of Queensland), and Mr. S. Castlehow (President of the University of Queensland Debating Society). Extending a welcome to the visitors, the Lord Mayor of Brisbane (Alderman J. W.Greene) said the debates served a useful purpose in the education and experience of those who took part in them. Debates were splendid things. As Francis Bacon said: "One hour's conversation was worth a day's meditation." Likewise, added the Lord Mayor, an hour's disputation was worth a day's meditation. The Lord Mayor of Brisbane said the "young men [and women] had more courage and audacity than older men. I was impressed by the fresh outlook of the trained mind. The University was training men to dissect and analyse many problems, and it was all to the good to have trained minds to wrestle with modern problems. It was a tremendous advantage for young people to have a training at the University and It was a good thing to have young people gather together to thrash out problems together." (The Brisbane Courier 20/08/1932) http://trove.nla.gov.au/ndp/del/article/21960080.